Bytescout Watermarking PRO is an easy to use application that enables you to protect your images by applying text and image-based watermarks on them. The program has a wizard-based layout that guides you through the watermarking process. On top of that you can resize and/or convert your images to other formats. You can use the application to apply a single stamp preset, which can be a custom image, a custom text, the file name or the current date. 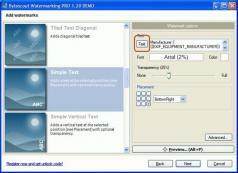 Images can be processed using multiple presets, so you can apply multiple types of watermarks at the same time. Bytescout Watermarking PRO can also be used to resize images and you can set the new size in inches, pixels, or cm, plus you can use several standard preset sizes typically used on websites and devices. Moreover, the program lets you apply several types of visual effects to your images such as blur, sepia, and grayscale, and edit EXIF tags.